I am writing this blog post after a warm sunny bank holiday in May. So this seaside town where I live can get packed with visitors from London and all over. These are people who come down to the seaside by train and car. We hope that they are in luck because the train companies often threaten an upgrade over any long weekend and some trains get cancelled. It is also rather bad for car drivers because our town fills up and there are no parking spaces on glorious day like this. And you might even find it hard to find space on the beach. But enough of the negative stuff because this is a very arty town. Brighton and Hove boasts many more artists than the average city. But where can you see them and their art, in the flesh, face to face? Four solutions to the problem. Of course there are several commercial art galleries in town. Commercial art galleries usually have a mixed exhibition with the same stable of artists showing all the time. The main contenders in this category are big slick organizations, each with a chain of galleries, showing the same rather pricey collection all over the country. Their artists are often contracted and tied to the gallery. You probably won’t meet the artists. However in Brighton there are some other smaller gallery businesses where you could find local artists. Another exception is down on the beach seafront. This is where there are a number of small mixed studios and art galleries open all year. 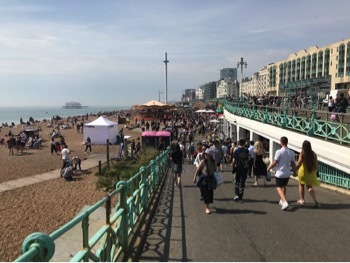 As you walk down to Brighton Beach from the Palace Pier, you will pass some unique shops under the arches, selling wonderful & unusual artwork. It is always worth stopping to have a look – some of the pieces for sale are amazing. All very well priced and all different. Well worth a look! Artist’s studios and houses are dotted all over the town. 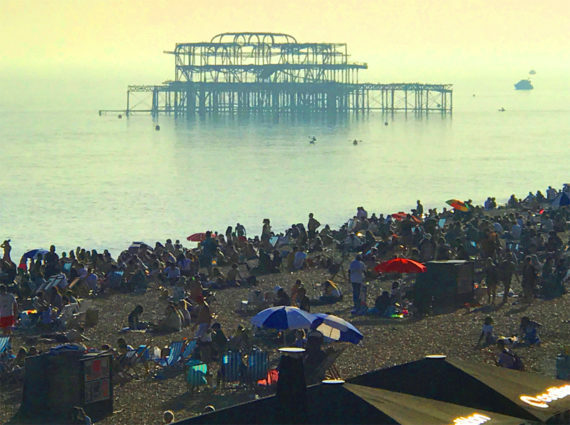 Right now here in Brighton we are having the 2018 International Brighton Festival with loads of super shows and exhibitions. This coincides with the ‘Artists Open House’ events where there are 200 plus artist’s houses open for free visits by hundreds of thousands of visitors. That’s every weekend in May and again before Christmas. Where to go to see the best? I am one of the Brighton artists. So is my wife Fran and our daughter Shyama. Where can you see our work? Where can you see paintings and prints by Colin Ruffell, Fran Slade, and Shyama Ruffell? In May we are exhibiting at one of the Artists Open Houses. In fact it is our daughter’s house at 13 Addison Road in the Seven Dials trail. We did the same last year as well. And during the 2017 Open House show we had a couple of visitors who introduced themselves as gallery owners opening a new art gallery on Brighton seafront. They even purchased a collection of my prints and cards and became one of the places where I now regularly exhibit my artwork showing Brighton scenes. And the ‘Artch Gallery’ is open pretty much all year round. So if you come down to Brighton and want to see the pebbly beach, fight off seagull attacks, jostle with happy crowds, and listen to the carousel music, then please pop into the Artch Gallery as well and have a look. The Artch Gallery is just down this ramp on the right. After the Artists Open House opportunity. In June we will be taking part in a pop-up show in the town. We have found and rented an empty shop for a month. Watch my blogs for more information. Here in Brighton we have some interesting and unusual venues. Previous articleTopics on my list. Colin Ruffell was born in 1939, then he was bombed, evacuated, educated, expelled, repatriated, married, bred, qualified and taught; until in 1965, aged 26, he became a professional artist. Since then he is proud and happy to have survived. He qualified from two Art Colleges in painting, design and printmaking, and the Open University in psychology and aesthetics, plus he has a reasonably clean driving license. He has founded, led or organised the following; Spectrum Studios, Artists in Action, Bayswater Road Artists Association, 9-Plus Artists Group, Buckingham Fine Art Ltd., Brighton Artists Workshop, European Fine Art Ltd., The Fine Art Trade Guild, The Fiveways Artists Group, and Crabfish Ltd.
Just a couple of things. © How to be an artist 2017.